Today's Royal Flusher Gambling Song of the Day (part 2) is The Man with the Golden Arm. Have I mentioned that I now have two nice hot Hawaiian girlfriends? They are lovely women, seniors, and pretty able of body for their age, at least in terms of being able to press video poker buttons and make craps bets. (More on that later). To keep our love a secret from Mrs. Flusher, we did not exchange names. I just know them by their blue hair and the twinkle in and around their somewhat wrinkled eye areas. The first, I met in the elevator, and chatting about gambling, we found we were both in the same boat - losing at video poker. We parted in the lobby and bade each other the secret gambler's benediction, which only the most savvy gamblers, and those of a feather indeed! know: "Good luck!". Would I ever see the first of my two Island Senior Girlfiends again? I broke one hundy into ten dollar bills, figuring that would encourage me to keep moving away from losing machines, and take lots of little breaks. Decided on Double Double, and who should be sitting beside me but I.S.G. number one. We chatted, and flirted, and I helped with her bill acceptor. It was a stirling moment in a pretty much horsecrap day. I ordered an Absolut on the rocks. There was no luck for me, but I.S.G. #1 hit a big quad, and then another one! We giggled like young lovers and I almost high-fived her, but felt that it was too early in our romance for that, plus I might knock her down. I.S.G. #1 played on and I ordered another Absolut. All of a sudden she gave the croaky, growly 80s-ish laugh that is so endearing and she'd hit the Aces, holding but one! This was remarkable and I was truly happy that her fortunes and turned around and I told her so. And frankly, I was kind of relieved, because I was starting to think that this might end up being a kind of 'sugar grandson' relationship. I ordered an Absolut for refreshment and played a bit more, but it was time to move on. I just wasn't winning a goddamned thing. I was out of my first hundy and down $500 on the day. Ugh. While sipping, okay guzzling, my Absolut, I realized that I was sick and tired of the stupid Tony Roma 'table number 69 is ready' announcements and I want to kick Tony Roma in his greasy meatballs. I also reflected that the guy making the Tony Roma announcements sounds exactly like Mr. Bean playing Enrico Pollini (Now, I know what you are thinking...) in Rat Race. Things were really looking grim. I walked back to the machines just off the lobby and found one near the Keno desk, all by itself. I wanted to hide and lose and hide. Thought maybe Bonus Deluxe was a good choice, since any four of a kind pays $100. That's the kind of bread I needed to stay alive. Good Lord, now I was really in it. What was I going to do??? I switched to the game on the machine that has the highest variety of large possible payoffs. Stuff like Aces with a 2,3,4 kicker pay $500, Queens with a 7 kicker on Saturdays pay $300. Kings with a Queen pay $400 and need to either come out of the closet, or tell their wives what they really need in bed. The game is called, I believe, Super Double Triple Overtime Desperation Hail Mary Bonus Poker, by IGT. I played. I really didn't think anything would come of it. The game is all about getting the Aces. That's where the big wins are, and the longshot royal of course. "One Headlight" by the Wallflowers was playing on the speaker above my loser head. Bingo. 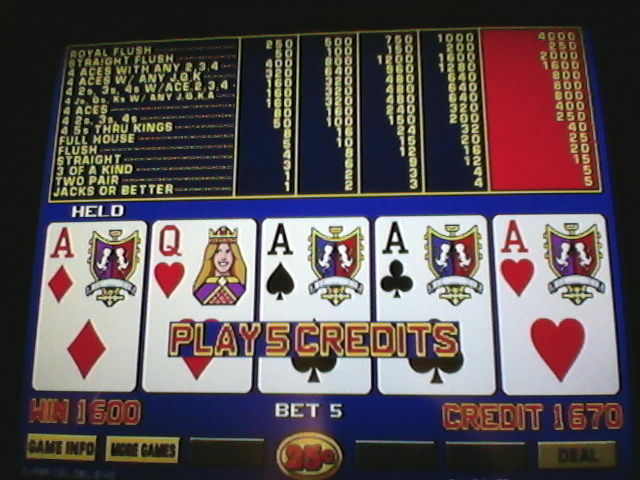 Or in this case, more specifically, Aces with Queen kicker, a $400 win. And just like that the weight of the day, of Lei Day, of the world, was lifted from my video poker knuckles. I rushed off to find my Island Princess Granny. I couldn't find her, but did a dance just as if she were in my arms, and trying to make sure her trick hip didn't 'go out'. Looking back on the events, I am starting to wonder if I.S.G. #1 hadn't soured on our relationship. I did notice a slight 'cooling' about the time I asked her if she looked as good out of her six medic alert bracelets as she did in them. Ah well, it's better to have loved and lost an I.S.G. than never to have gotten the $400 now sizzling in my pants! The $3 craps table looked awfully good. I sidled up and bought in for forty bucks and the cocktail waitress happened by, so I ordered an Absolut on the rocks. We got started and a few rolls went by, had the 6 and 8 covered, hit a six or two and pressed it up. And that's when everything changed when Island Senior Girlfriend Number Two came into my life. "This table hot or cold? ", she said, a twinkle in the wrinkled area around her eyes. "Aloha, baby," I said, "the table's hot and so are you!" I said it exactly like that, except for the first part, and the second part. Actually, I said "the guy's been hitting some sixes". I really was too dumbstruck by what her beauty must have been 60 years previously to make any kind of advance on my new Island Girlfriend, who had bought in for $200. Impressive! Oddly, I.S.G. #2 didn't make a bet right away. In fact, she stood and watched for the longest time. My Absolut arrived and I ordered a refill and said to I.S.G #2, "You should at least make a bet for the dealers if you're going to stand there." I think that love was on the felt at that moment in our lives. Few more rolls went by, the guy kept hitting sixes. Crazy. One roll was a 12, six-six, very unusual. "You should put about $25 or $50 on the 12 hitting again," I advised, very knowingly. This brought a laugh. American Pie was playing outside on the 4 block Viva Vision(TM) canopy and my Aloha Lady Friend was clapping along - in a fashion that can only be described as "randomly". Still, I admired her enthusiasm for the arts, even if she couldn't carry a tune in a coin bucket. The dealer across from me, Maryann, was, I think, enjoying watching our flirting, and was probably somewhat jealous - I'm a pretty prime catch, for a married guy. She mispaid me on a bet (odds on the ten, which should be double, she paid me single) and I pointed it out. And then she adjusted her working stack of dollar chips which was sky high, got them straight and then deftly knocked them down, all over the place. As Maryann scrambled to right the stack of 40 or 50 chips, I pointed out, helpfully, "Hey. You knocked over your stack." "Yes, and I short paid you $5. Anything else?" I smiled at her and crossed my eyes and stuck out my tongue a bit. She laughed. I pushed a stack of three $1 chips across the felt. "Three dollar eight please. Try not to knock the stack over this time, okay?" We got talking a bit, and I told her who I was. "I'm Royal Flusher, and I have the business card to prove it." I flipped one of my cards onto the felt. The pit boss immediately grabbed it up and examined it for signs of tampering. What is it with those guys??? From then on Maryann called me "Royal", actually, the first person every to do that. I felt kind of proud. You do realize that Royal Flusher is just the 'nom de plume' of Royal Flusher, right? I turned to I.S.G. #2. "You should put about $75 on eight. I feel lucky about it!" She just laughed at me again. Eventually the table turned cold and my $40 buy-in dwindled to nothing. I.S.G.#2 had cut and run to minimize losses, and to keep me from giving her any more stupid gambling advice. And I realized that Absolut does not replace dinner. It was steak night at the buffet so I ambled (read weaved) over. The buffet is great. You get to meet all sorts of interesting people as you try to find the hot sausages at the bottom of the pile, or load up with 4 plates of tiny cheesecakes. And one of the things I like most in life is meeting people from different cultures, learning from them, and ultimately making fun of them later. It so happened that I heard some cultural mutterings from some extremely hot young ladies in line just behind me. "I've either had too much to drink, or you ain't speaking English." We said hello and I said, "Sprechen zie English?" "Ya," she said, "sprechen zie deutsche?" "Nien," I said, "just sprechen zie english, and that's all." We had an interesting conversation - the group of them, six in all, three incredibly hot young frauleins and their ripped, muscular, body builder husband/boyfriends. Holy moly were these guys buff. I debated asking them if I could eat dinner with them but then thought, no, I want to live. Got a table and a steak and it was awful. C'mon Fremont, what is that shite, grade Z utility beef? There wasn't a bite that was all gristle. I went back to get some fried chicken or something and bumped into the head fraulein who I'd spoken with. "What did you think of the 'steak'?" I asked, making the quotation marks around steak in the air. "It vas, well, okay, I guess, it vas fine." Clearly being polite. I went up close behind her and made the sound a horse makes when it flaps it lips. She laughed. On my way out, some of the German guys were going back for more food. "What did you think of the 'steak'?" I asked, making the quotation marks around steak in the air. I made the sound a horse makes when it flaps it lips. Frauleins are much easier going than their body builder boyfriend/husbands. I headed for the exit, and up to bed, feeling like a winner. Sort of like the horse that won the Derby. For the others in that race that didn't do so well, you never know what's at steak. I hate those Tony Roma's announcements, too. And you are spot on with that video -- he does sound like that!